Rating: 84 percent based on 791 votes. 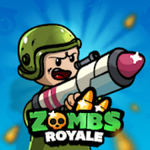 Description: Zombs Royale is an addicting multiplayer battle royale game similar to PUBG or Fortnite. You parachute from a plane into a map filled with hundreds of other players and you need to try and be the last man standing. Loot weapons and supplies around the map to help you survive.